The Voice Morpher pane comprises the Pitch and Timbre graph and the Advanced Tune.The two most important parameters of a human voice are the Pitch and the Timbre, whose combinations will create the differences of each voice. - On the main panel, turn on the Voice Morpher panel (1). - Move the cursor (2) on the Pitch-Timbre graph (also called the Morpher graph) to change the voice. - Move the cursor toward the right side to have a more feminine voice or toward the left side for a more masculine voice. - Move the cursor up to have a younger voice or down to have an older voice. - To enhance the quality of the changed voice, use the Advanced Tune (3). Move this cursor gradually to keep up with the adjustment. Move the Advanced Tune to the left in case your morphed voice becomes unrealistic. Open the Advanced effects panel. 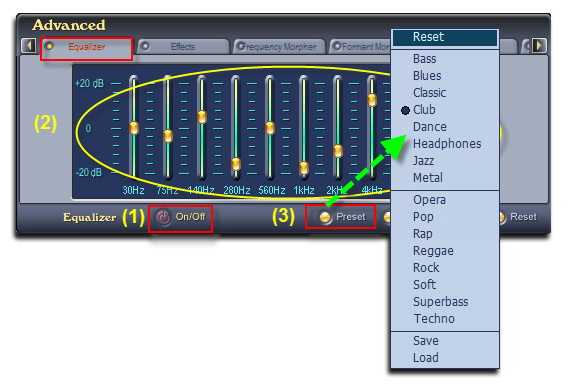 Click on the Equalizer tab, turn the tab on (1), adjust the sliders (2) to manually change the equalizer bands or click on the Preset button (3) and choose a preset from the popup menu. Tip: If the Equalizer tab is ON, the On/Off button is red. - Click on the Effects tab, turn the tab on (4), then on the Effects tree on the left, choose the effects you want to use. Those effects will be listed in the Selected effects list on the right (5). The effects will be applied right away. Tip: If the Effects tab is ON, the On/Off button is red. 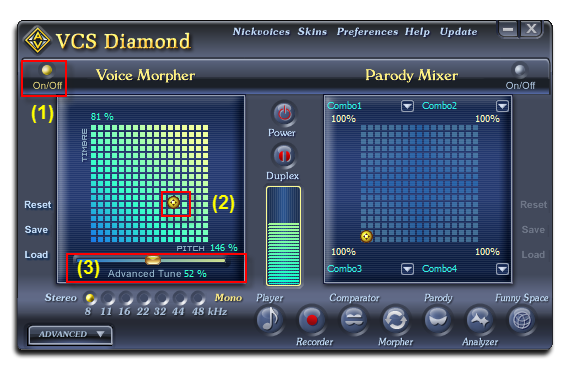 Combine the morphing effects of Voice Morpher with the Parody Mixer is also an advanced technique to create unique adjustments to voices and sounds. 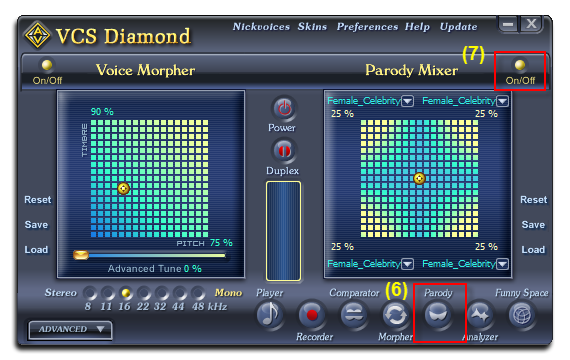 After you have morphed the voice, use the Parody Maker (6) to import it as a parody, then use the Parody Mixer to mix up to 4 parodies together to create one unique output voice (7).